As a Loyal Customer, you haven’t taken the leap to be a distributor — and that’s okay! But that doesn’t mean you can get more involved! Just for sharing your custom URL with your friends, family, coworker, anybody and everybody you know, you’ll instantly get 10 perk points! 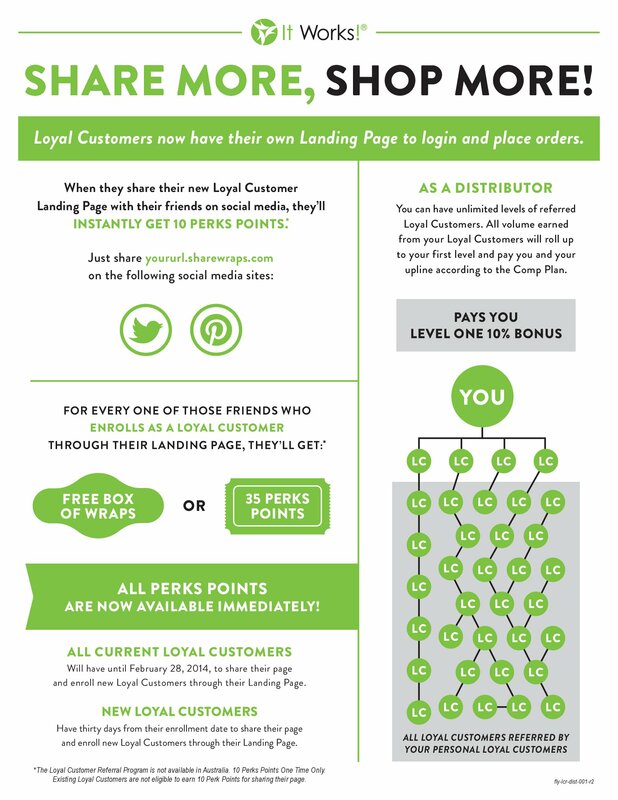 These perk points can be used for more free products! New Loyal Customers will have 30 days from the date of enrollment to share their URL and enroll new Loyal Customers through their landing page. If you’re already a Loyal Customer — don’t worry, we’ve got your covered, too! You have your own URL and landing page as well! Log into your account to retrieve it and start getting the word out! 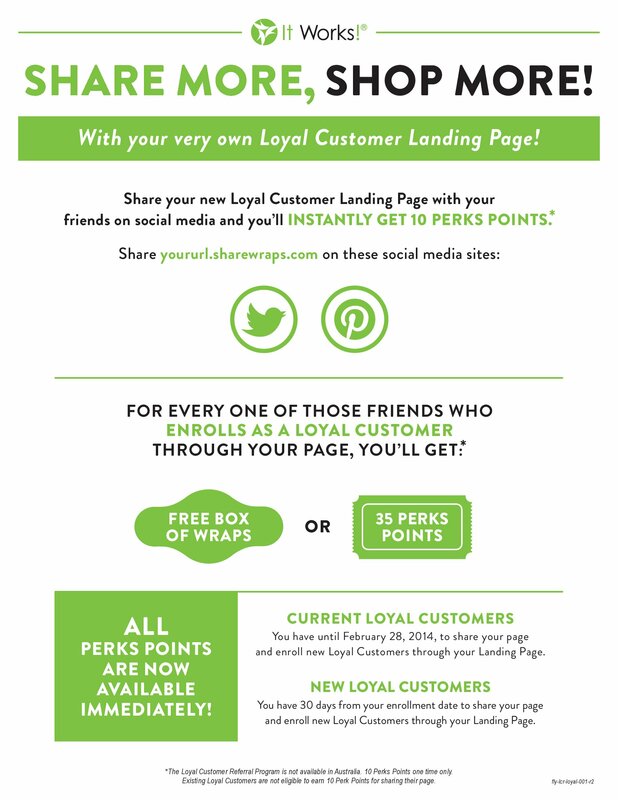 You have until February 28th, 2014 to share your URL and enroll new Loyal Customers through your landing page. As if that’s not exciting enough, all perk points are now available immediately! No waiting to redeem them for free products. If this sounds good, but you don’t know what a Loyal Customer is, read all about it here. Are you ready to place your order and start getting Free Wraps? Place your order now! Hosting an It Works Wrap Party is so much fun and a great way to earn a free wrap. Not to mention, it is so just so simple! No need for a huge spread of food and drinks since your guests are there to tighten, tone and firm. But if you wanted to have food, make it fruits and/or veggies and water, that is just perfect too. You will invite as many people as you want to join you to get wrapped in the comfort of your home and each will pay for their own wrap at the party. Prices may vary a little depending on what country you are in. In the US, most of us charge $25 per applicator. What happens at a Wrap Party? Most times we will set up a wrap station in a separate area from where everyone is gathered. As your guests arrive they will go directly to the wrap station, pay for their wrap and get wrapped. They can choose what area they want to tighten, tone and firm. (Tummy, arms, legs, back etc.) Once your guest is wrapped we send them out to join the party. After all your guests who want to be wrapped have the applicator on, you will all get to listen to a short presentation about some of our other amazing products and get to try samples. We will answer all questions at this time as well. Next we start to unwrap the guests and get excited about their results! I love this part! Lastly, when people want to purchase product or sign up as a Loyal Customer or a Distributor this is the time we do all that. All in all your party should last approx. two hours. Some people like to have a theme parties and they are still super simple! You can make this whatever you want to make of it! This is your wrap party so feel free to be creative if that is your personality and want to put a fun spin on it. Otherwise lets just do a good ole fashion Wrap Party. I can help you plan your wrap party and give you some ideas of wrap parties we’ve had in the past. It’s really about what you’re comfortable with and what is easiest for you! Give me a call at 888-827-7107 so we can set something up for you! You have a couple options here! You can contact the person that you enrolled under to help you or the other option is to contact customer service regarding log in issues, autoships (editing or canceling) or shipment questions. We do experience high call volumes in the morning and at the end of the month so if there is a way for you to call outside of those hours that would be best. Apologies that I could not be of more help, but I am a distributor and don’t have access to your account information. Once you have completed your 3 month commitment you must call It Works directly and ask them to stop your auto-ship otherwise you will continue to get an order. After the 3 month obligation is complete you will always be able to order at the wholesale price without any future monthly commitments. If a year passes and you want to order a box of applicators at $59, then you can by simply logging in to your website or calling in the order. Most orders will be shipped from our distribution center near London. a) All merchandise must be returned by the Distributor or Customer who purchased it directly from It Works!. b) All products to be returned must have a Return Authorization Number which is obtained by calling the Customer Services Department. This Return Authorization Number must be written on each carton returned. iii. the unused portion of the order in its original container. d) Proper shipping carton(s) and packing materials are to be used in packaging the product(s) being returned for replacement, and the best and most economical means of shipping is suggested. All returns must be shipped to It Works!, shipping pre-paid. It Works! does not accept shipping-collect packages. The risk of loss in shipping for returned product shall be on the Distributor or customer. If returned product is not received by the Company’s Distribution Center, it is the responsibility of the Distributor or customer to trace the shipment. e) If a Distributor is returning merchandise to It Works! that was returned to him or her by a personal retail customer, the product must be received by It Works! within ten (10) days from the date on which the retail customer returned the merchandise to the Distributor, and must be accompanied by the sales receipt the Distributor gave to the retail customer at the time of the sale. It is now one week into the new year! How are your resolutions coming along? Have you began to execute your list? Or have you become creative with your excuses for why you are slacking? It’s okay — we all do it! But I am here to offer a little encouragement for you and this brand new year! The first step to leading a healthy lifestyle is encouragement! Instead of listing off negative resolutions, such as “stop eating junk food, watch less mindless television, worry less” — jot down positive notions! By listing goals in a positive manner, you are more likely to want to conquer them rather than mope about quitting something. For example, “eat more clean food, be more active outdoors, focus on happiness” and so on! Having an encouraging list of resolutions will give you that push you need! By simply writing down your positive goals, I bet you will feel instantly better! Writing your resolutions is the easy part, am I right? 1, 2, 3… – done. Ah yes, but you aren’t done! Now the real work begins! Remember, this isn’t just about putting forth effort to make change happen — this is about improving your life so that you are living the best way possible! Happy and healthy! Write down your ideas and goals that you have thought about achieving, even if they seem a little silly. By compiling a list, you are physically putting it into the universe and creating positive energy that will benefit you! Give yourself a completion date for each goal. Rewrite your goal as: “I will _____ by (date).” For example, if your goal is run a full or half marathon, register for your goal race now. Then, start with small milestones, such as, “I will be able to run around the block without stopping before the end of January” (maybe you have a really long block!). Giving yourself checkpoints helps makes the goal seem more attainable. Share your goals with your friends and family. Studies prove that successful people voice their goals and ambitions. You may even encourage others to set goals of their own or even join you on your journey towards your own! If you share your own goals, chances are, you’ll unknowingly motivate others to pursue and share their own! A domino affect! Choosing your goals from your wish list should be fairly simple, but if you’re having a difficult time, take a look at your everyday habits. Evaluating any “trouble spots” in your everyday routine can help you set up a course of action to make 2014 your healthiest, happiest year yet! 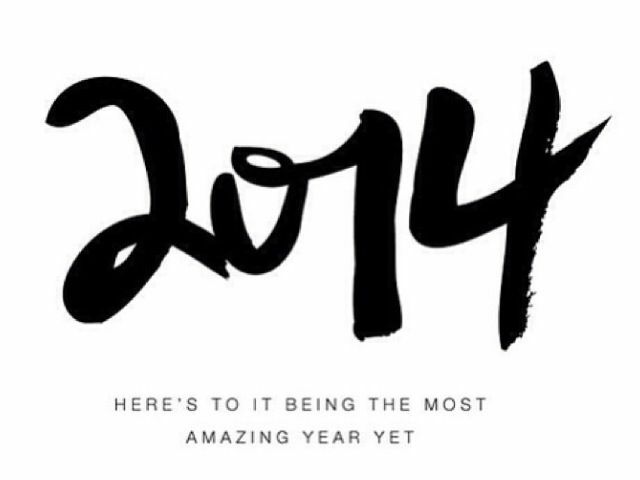 I would love to know what your 2014 resolutions and goals! Follow along with me on Facebook and share with me what you would like to accomplish in this new year!